Not sure where this came from, I think somebody had it at one of the field day events, if I knew where to look I'd go get one myself! 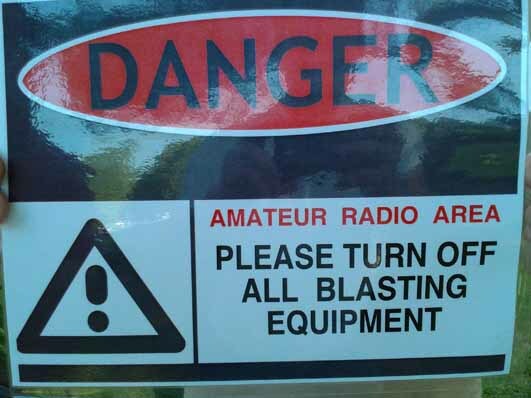 Never heard of Ham Radio? Check out my page about ham radio and, if you are interested, how to get licensed. I like computers and trains, as well as taking photos of trains. Eventually learned out I could listen to the railroad dispatchers on a "Radio Scanner" device and immediately wanted one to know what was going on and when the trains were coming. One Christmas I got a RadioShack PRO-97 tripple-trunking analog scanner from my Grandparents, and in addition to finding the railroad and local Fire/EMS I discovered it could scan Ham Radio pre-loaded ranges. After weeks of scanning different random things on my new toy, I stumbled onto WW4VA 145.270 Stafford, VA where I frequently heard people talking around rush hour, and gathered they were using a device called a "repeater" up on a high tower to talk farther, which is what I was really listening to. After a while of listening to people talking about random things I didn't understand or care about at the time, I heard a few people mention things with computer-technology and trains -- which caught my attention and got me interested in learning how to talk to these people. After some searching I decided it was too hard to figure out on my own, especially finishing High School and looking at college. As I studied Computer Science in college, one of the required classes was "Computer Systems & Architecture" which included a section on building simple circuits from resistors, and/or/not chips, 555-timers, D-flip-flops, and some other theory of how these all work together. This all seemed interesting though I didn't see much of an application outside my personal hobbies (model train accessories!) All this was fine and good, but then I had to move on and get a job and settle for what I had time for. When I finally graduated and got a job, I wired up my car with mag-mount antennas for a CB, my scanner, MiFi (streaming music is better with good internet). I happened to use a 19" high-gain multi-band cellular antenna for my MiFi which helped eliminate the one dead spot. Neat, eh? At work, I noticed there was a HAM plate on one of the cars and recalled my interest in Amateur Radio but by now I didn't have sufficeint time to investigate licensing and also the repeater I knew about had been dead quiet for some time, I'd forgotten about it...until one day I was coming or going and ran into Bob, AA2FD who asked about the antennas I had on my car. One thing lead to another, and I got the little bit of help and encouragment I needed to understand how to properly study and what the steps were to take the license exam. After some planning and anticipation, myself and my friend (who also worked with me in my computer class and ended up as a co-worker also interested in Ham Radio) went up to try and get licensed...and passed! Now I could finally talk to some of these people that I used to hear on my scanner (well, after I got a new radio because the used VX-5R died the 2nd day I used it to listen, it was super hot and wouldn't transmit). So now I had a nice VX-6R and say stuff! As I started work, I ended up with 2 roomates (all 3 of us Computer Science majors with the same classes as background) -- one of them very interested in hardware-hacking type (now KK4TNJ) stuff and the other costume conventions (still nagging to try the license exam). About the same time, I was also falling out of communication with a good college friend (now KM4JPX), but introducing them to my new roomate sparked the surprise they were both interested in the same costume stuff just different aspects of it! (more on this later). The hardware-hacking roomate caught my interest with the SDR receivers and computer-radio integration, and then one of the costume convention programs shocked me when I noticed a "Fox Hunt Radio Direction Finder" activity and went to one only to learn a lot of people doing that were also Hams and talked on Echolink regularly. Now I had to work Echolink into everything somehow - I didn't like using an "app" but with my interest in hardware stuff, I quickly learned I can connect Echolink to a radio thus feeding into my hardware hacking interest and sort of merging everything together. Somewhere along the lines I was also introduced to a "friend of a friend" (now K2KAT) who got me interested in some elevator hacking DefCon talks (amazing how those things work!) and started finding all sorts of other nifty tech details on all sorts fo topics. Now one thing has lead to another, so mixing hobbies has led to a number of interesting projects into all sorts of new things in ways I never dreamed of. And it all started because I liked computers and trains. Got all that? If so, maybe you can explain it to me so I can make it intelligable. If not, no worries. At this point, most of my "on air" operation is thru the RVARC club repeater as I drive to and from work though I also monitor 146.520 simplex at the same time. I've started to play with HF a bit, and have a well tuned 40m V-shape "slinkey dipole" (best-case 1.1:1, worst-case 1.7:1) hanging from my apartment cieling, the noise floor is extremely high usually around S8 which makes operating a challenge. It's my goal to get better with operating and come up with a system where I can drive somewhere, park, and operate from temporary locations. For now, I have had the best luck on JT65, the software usually copy contacts even though I can't hear anything but static. I have an APRS iGate (KK4NDE-1) and Echolink node (KK4NDE-L) running in a mini-ITX computer case for portability all controlled by a Raspberry Pi 2 Model B. Check out the "Hobby Projects" area of my site for all the details on these and other projects!